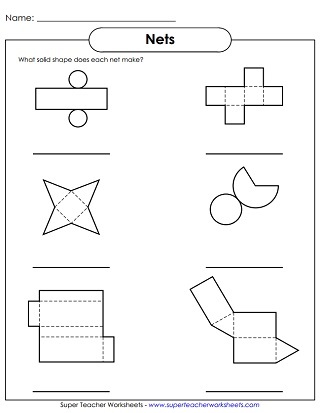 This page contains printable geometry worksheets for teaching solid shapes. Students identify the following shapes: rectangular prism, cube, sphere, cone, pyramid, cylinder, and others. Determine whether each object is shaped like a cone, cylinder, rectangular prism, cube, or pyramid. Look around the classroom and try to find a sphere, cube, rectangular prism, and a cylinder. Identify each shape on the page. Includes both solid shapes and flat shapes. Determine the number of faces, edges, and vertices on each solid shape. Cut and fold this origami cootie catcher (a.k.a. fortune teller) game. Play the game to review the names of solid shapes. Cut, fold, and glue this pattern to make an orgami cube! Create a solid, 3D triangular prism with this printable. Cut the shape and fold the tabs to make a cylinder. Cut out the shape and fold it along the lines to make a pyramid. Another foldable tetrahedron, or pyramid with a triangular base. Cut out and fold the decahedron, or ten-sided solid shape. It's perfect as a ten-sided die for classroom games too! 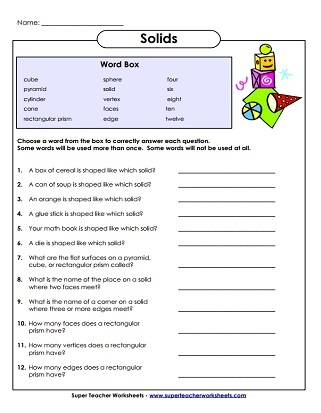 Choose a word from the word box to answer each of these questions about solid shapes. Five questions about solids that require logical thinking skills. Match the polygon or solid shapes with their names in this concentration-style memory card game. Take photographs of geometric lines and shapes. Then use your photos to make a picture book. Tell what shape is made by each net shown. Shapes include cube, rectangular prism, cone, pyramid, and triangular prism. Examine the pictures of the nets carefully and answer the multiple-choice questions. Match each solid shape with its net in this cut-and-glue activity. Sort the shapes into two groups on the t-chart: solid shapes and flat shapes. Worksheets on polygons and flat shapes. 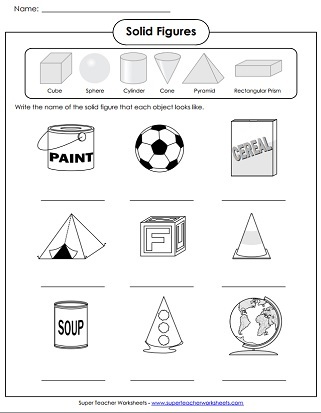 This page has Pre-K through 1st grade worksheets on identifying solid shapes.